Chinmay is all set to free himself from the worldly affairs. He finds solace in the old library with his friends Anu and Sabi. There life was monotonous until one day when they have to escape. The Seekers School is not in its full form after some people decides to change the shape of the administrative wing and the modus operandi. What happens when Chinmay and his friends are stuck at a place and its whereabouts are unknown to them? Will they remain in mental despair or will things change shape? The title and cover were both were meaningful and far-sighted. I loved the colours, tones and richness of the cover. It is definitely eye catchy and also it says a lot without any extravagant detailing done. There were characters from two phases and I loved all of them. They were crazy, humorous, deep, dark, mysterious etc-etc. I liked the balancing that was done in order to bring in front both negative and positive characters so that some phrases become clear and impactful. From the major characters I liked Chinmay and Siddhartha. The analogy maintained between them was superbly penned. From the minor characters Sabi, Professor, Govind, Roshan, Nivedita etc were some of the characters which keep helping the major characters to move ahead. And I loved their movements, talks and traits. The first person narration was not bland at all. The story seemed more lifelike with that. I liked the change of speakers with the movement of the story. I felt that the number of chapters could have extended because a lot was said in just one go. 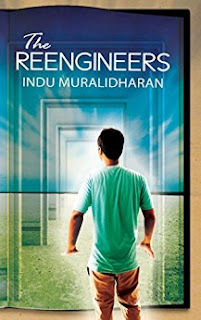 At first I thought that “The Reengineers” is about the gloominess that some students would face or are facing in their lives. But Indu Murlidharan really surprised me as I preceeded ahead. I was not at all ready for a book like this and after completing it I was certain that my time is invested at a very worthy place. Such was the beauty of the book. The book started at a normal pace and a larger space was given to the readers to know the three friends who are somehow travelling in the same boat which has traversed from different shores. A deeper analysis was done at one point and other to showcase the mind-set of Chinmay, Sabi and Anu. All three of them had an enormous amount of pain within themselves and it was well portrayed. I could connect with them and their depression without any efforts. Twists and turns are the lifeline of any book and this particular book has loads of such surprises. The first turn that came in the book was enough to tell me that something big is on the way. I was perplexed just like Chinmay and others. I loved the advancements thereafter. There were so many important aspects and teachings that were shown by different characters. The whole aura that was created of a secluded place offering numerous courses was ecstatic to experience. I liked the sarcastic imageries. Further there were some particular places where I was enjoying the richness of the book. The letters written by the Siddhartha were my favourite. They had so much to say in just few words. Also the different type of people which he explained was serene and meaningful. The conversation between Chinmay and the Professor was the cherry on the top. Who can think of such an ending? Kudos author. Summing up- The novel started at a very different note and ended up in a totally different dimension. I was dumbstruck to know the ending and the proceedings that lead me to such spectacular ending which was just smooth, interesting and not at all hasty, allowing each and every difficult turn of events to be grasped with ease. The book came as a surprise package for me. A fantastic read. • The different levels at which the book went to entertain the readers. • Wide variety of characters of different hue and persona. • Deep analysis shown inside the story and its perfect blending with the moving picture. Well this book can be read by all those who are fed up of their lives and who are trying to find answers in the self help books. Also fiction lovers can pick it for some different angles mixed up to form such complex yet easy going compound. Indu Muralidharan grew up in Madras, in a small house with a large library. She counts a number of characters from classic English novels among her early friends. Her obsessive love of fiction led her to delve deep into meta-fiction, reading and writing stories about books, writers and writing process, which she believes helps her to better understand the nature of reality.